The chapter begins with a story of Pete, a cofounder and CEO of InstaViser and also a member of the 2000 and 2004 Olympic U.S. Men’s eight rowing team. He knows about winning and accountability. In his sport the team members are literally in the same boat. Pete told the authors about the 2000 Olympics. The team was undefeated during the Olympic cycle leading up to the games. They were heavy favorites to win the gold, but they finished 5th. No medal at all. Some members of the team would be too old to compete in 2004. It was a dreadful experience for them. Looking ahead to the 2004 Olympics in Athens, some of the athletes decided not to compete. Some were married and had kids. Others wanted to avoid going through another four years with the possibility of repeating an awful experience. Pete said a few of them decided to stick with it though. They knew they needed to band together in order to be leaders for the upcoming team members. Three members of the 2000 team competed in the eights in 2004. During the months leading up to the games there was a lot of peer accountability among the three veterans. The younger members grew to rely on the leadership provided by the three, who would rotate leadership based solely on the organic need. They didn’t structure anything. They just did what needed to be done. The veterans were on a mission to make sure they didn’t repeat the mistakes of Sydney. The goal was to win gold. In 2004 the U.S. men’s eight won gold decisively largely because they had embraced a culture of accountability. What does accountability really mean? It means different things to different people. There’s an emotional component of how people feel when being held accountable. In early Greek civilization citizens would cast a vote by stepping on a stone; that’s how they’d account for themselves and demonstrate where they stood. Accountability doesn’t tend to be a favorite word because somewhere along the way it got a bad rap. People can think of it as punishment or mean spirited. The authors discovered some things when they looked at the education system in Finland. Ranking among the very top in the world in reading, science and math, Finland’s education system emphasizes investment in professional development of teachers. The country spends very little money or time on measuring learning outcomes through standardized testing. They’ve created a culture where teachers accept responsibility for teaching their students. And they’re given the freedom to do it based on the needs of the individual school and students. There is no word for accountability in the Finnish language. Instead, accountability has been described as “something that is left when responsibility has been subtracted.” So it appears to have such a negative connotation that the language lacks any word to really describe it. Do you realize that this is one of the few places where we can go to get support that comes across as unconditional love, unvarnished, with no other strings attached? There are few places where we can go in life where somebody doesn’t have an agenda, doesn’t want something from us. This is one of the few places where we can show up and hold one another accountable to keep that level of behavior in front of us at all times. What CEO needs more accountability? The authors say they have talked with enough CEOs through the years who declare they already have enough people to whom they feel accountable professionally. But, as the authors point out, there is an accountability dilemma. Former Vistage CEO Rafael Pastor created a CEO accountability model where the CEO is at the center. On top is the board. To one side are peers. To the other side are customers. Below are employees. Rafael says CEOs are already being held accountable up, down and sideways. He calls that upward accountability, to the board or shareholders, as ENFORCED accountability. Goals and objectives are set for the CEO by those folks. Employees hold the CEO accountable and he calls that EXPECTANT accountability based on what each group (employees, contractors, etc.) expect. All CEOs have customers to whom they’re accountable. Rafael calls them ELUSIVE accountability because customers are fickle so you’d better be sharp and give them what they want. These 3 types of accountability are imposed on the CEO. That’s why some CEOs may resist adding still more accountability to their lives. But that brings us to what Rafael calls the 4th type of accountability, EMPATHETIC. That’s the accountability provided by peers. It’s the type that is missing because it’s completely voluntary. The other types of accountability are imposed. Because peer accountability is voluntary it stands apart from the others. It helps CEOs deliver more effectively on the other three types. That’s why top performing CEOs don’t mind volunteering to add another dimension of accountability to the mix. 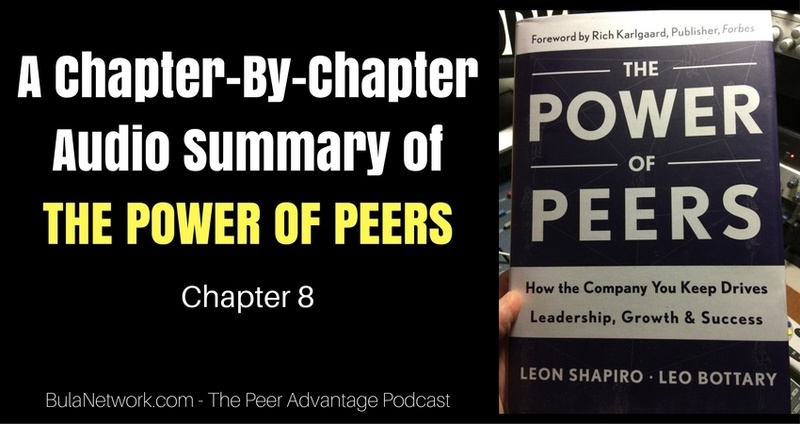 Shapiro and Bottary, coauthors of the book, cite an example of a CEO who was encouraged to give a board presentation to her peer group first. She rejected the idea at first, but finally agreed. It was an ambition presentation she was going to deliver to her board requiring a $55 million investment to build a container center at the port. She delivered the presentation to her peer group. They tore it to pieces. It was aggressive and impersonal. With her permission they offered suggestions on improving it. She was taken aback, but grateful. At the next meeting she reported that her board told her it was the best presentation they’d seen. When they asked her how she did it, she credited her peer advisory group. She trusted their judgment, made the necessary changes and delivered a successful presentation. Just one example of the power of peers. Walter and Debbie are architects. And married to each other. They started their business shortly after marrying. It began in a closet in the bedroom of their first home. Today, it’s a $30 million company. Walter has been a member of a professional peer advisory group for 8 years. During that time his group has seen him raise 3 daughters and grow his business. The conversations have touched every area of his life. During one meeting he revealed that he’d done little to set up trusts for his three daughters, or to get his financial affairs in order. What if something happened to him? Or his wife, Debbie? What if something happened to them both? Debbie always wanted to handle it, but Walter would drag his feet. But when Walter brought this up to his group, he agreed to follow their advice and get right on it. As the group continued to meet, Walter pushed it off claiming one excuse or another. The group was relentless though. They continued to raise the issue with him at every single meeting for nearly a year. Toward the end of the year they’d sent Walter emails saying they were going to bring tar and feathers to the next meeting if he refused to take the action he promised. They didn’t let him off the hook. Finally, he got his affairs in order, shared it with the group and they broke out in jubilant celebration. In many cases, CEOs will delegate tasks they find uncomfortable, unpleasant or boring. In other situations though, when CEOs have to complete certain chores themselves, they can find the same reasons to procrastinate that everybody else does. Professional peer advisory groups can play a big role in helping CEOs take ownership and responsibility for getting the task completed. Go back to Walter’s story. There were 2 aspects of his story that are important. One, the group truly cared about Walter and his family. He told the group it was important to him. That’s why it was important to the group that he follow through. Two, while it’s unusual that something that important would take a year to accomplish, it shows that the culture of accountability requires more than a single follow-up. When the task was completed, the entire group rejoiced, proving to Walter that they were all on his side. We’ve all learned that what gets measured gets done. What gets rewarded gets done better. But the intent of the tracking or measurement can make all the difference. For too many employees it feels like a stick and no carrot. The Oz Principle: Getting Results Through Individual And Organizational Accountability by Roger Connors, Tom Smith and Craig Hickman define accountability as “a personal choice to rise above one’s circumstances and demonstrate the ownership necessary for achieving desired results: to see it, own it, solve it, and do it.” The authors who an above the line and a below line metaphor. Below the line thinking and behavior is victim thinking. Above the line is accountability. See it. Recognize and acknowledge the full reality of the situation. Own it. Accept full responsibility for your contribution to the current experience. Solve it. Change the current reality by identifying and implementing solutions to your problem while being conscious of “below the line” behaviors if challenges present themselves. Do it. Fully commit to follow through with the solutions identified, especially when there is great risk in doing so. The ignore and deny stage: where you pretend there is no problem. The it’s not my job stage: when you’re aware there’s a problem, but you avoid involvement. The finger pointing stage: when you deny responsibility for bad results and shift the blame. The confusion/tell me what to do stage: when you avoid responsibility by claiming confusion. The cover your tail stage: when you create stories about why you’re not responsible and show not be blamed. The wait and see stage: when you know there’s a problem that requires action and you choose to not act in hope things will magically improve. Accountability starts with the character of the person. Then it’s about making sure the bonds created among group members are strong, but don’t interfere with a member’s responsibility. Social interactions are wonderful, but at the end of the day you’re there as a peer to give feedback. Being open to learn is another component. Members have to be coachable, willing and eager to learn and improve. Urgency is more about focus than speed. It’s about priorities, putting first things first. Reputation is what you earn when you display strong character over time. Greg offers a quote he once read about Babe Ruth. “Yesterday’s runs don’t win today’s games.” That’s what evolving is all about. It’s about getting better. Over time member in a professional peer advisory group will come and go for a variety of reasons. But it’s important for the group to grow. The culture and experience of the group accumulates leaving a legacy. Many professional peer groups have a 3 month lead time for departures for that very reason. Members need time to say good-bye and thank you. We need time to seize the opportunities of leaving a legacy in our quest to get better. Peer influence is individual. Peer advantage is a group endeavor powered by greater selectivity, targeted strategies for achieving goals and structured engagement that inspires lasting results. That’s precisely the objective of THE PEER ADVANTAGE by Bula Network. I’m currently accepting applications for membership in two groups of 7 SMB owners from around the United States. Each group will meet online via a video conferencing platform, making it easy and convenient for members to attend. We’ll meet for 2 hours twice a month. One group will meet in the morning and the other will meet in the afternoon. Members will join one group or the other. You can visit ThePeerAdvantage.com for more details and to complete the application. I hope you’ll do it today. If you have a chance, please leave me an honest rating and review on iTunes by clicking Review on iTunes. It’ll help the show rank better in iTunes.